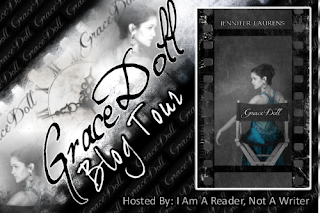 I am pleased to have author, Jennifer Laurens, whose recent book, Grace Doll, is virtually touring the blogosphere right now! Usually, I mull over an idea for a while (months, even years ) before it hits the paper ( or computer ) With Grace Doll, I originally wrote it as a screenplay years ago, then as a women's romance, and then as a YA novel. The story went through A LOT of changes in the process: the screenplay was a romantic comedy. The final tone was much darker--something my writing tends toward. Since junior high school. Once my 6 children were all in school, I started writing full time. I love it because it gives me a safe place to explore ideas and it's a creative medium I have control over. ( Like in Heavenly, my personal 'purge' novel about my feelings toward autism, handicaps, society accepting handicapped people, drug abuse, alcohol abuse and the affects on a family, life after death, guardian angels) I was able to control the outcome of a situation that, in real life, I have little control over. Writing about things that matter and things that just plain make me smile is a major stress reliever for me. Besides writing, I love traveling, weight training, doll collecting, miniatures and anything and all things Disney. 4. Something people would be surprised to know about me is…I sing opera. 6. I can’t live without…My family. My laptop. My Samsung Galaxy 2. Mascara!! I loved writing both POVs---seeing the story unfold from both Grace and Brenden's perspective was fun and challenging, getting the 'voices' down. Also, I adore Rufus Solomon --- he's so despicable. I'm working on a ghost story. 9. How can your fans stay up to date with what you are doing? I'm always ready to embrace new friends. I encourage readers to find me on Twitter and Facebook--I'm active on both, with chats and giveaways.